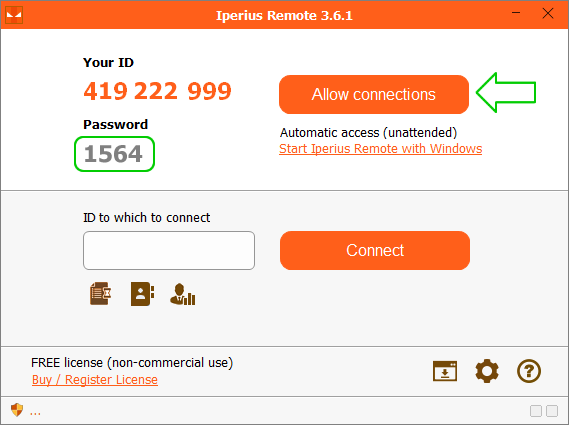 Use Iperius Remote to connect to your customers, to your home computer or to any other computer with an Internet connection - it's extremely simple. 1. 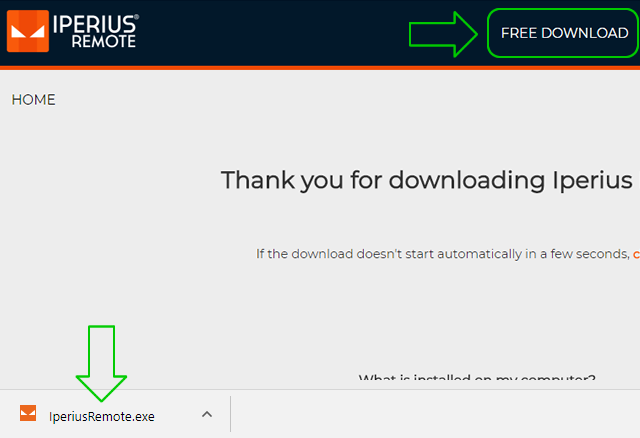 Download Iperius Remote and run it (no installation is required). You can decide to either save the executable file onto your hard disk and then run it, or to open the program directly from the browser. 2. Click on "Allow connections". 3. Give the operator your ID and 4-digit numeric password. 1. Open Iperius Remote and enter the remote computer ID. 2. Click on "Connect" and then enter the requested password. Within seconds a new window will open and you will have access in desktop remote mode. You now have control of the computer and can perform any operation as if you were on site. At the top, in the title bar, you will be able to see the details of the remote computer. You will also be able to perform various tasks with the command bar: you can send the command Ctrl+Alt+Del, set the full-screen mode, transfer files, open a chat session etc. When you purchase an Iperius Remote license, you receive a Master account and a Client account with their associated passwords (which you can change in your restricted area). All the clients where Iperius Remote is installed, i.e. the remote computers you wish to connect to, will require the insertion of the Client account. 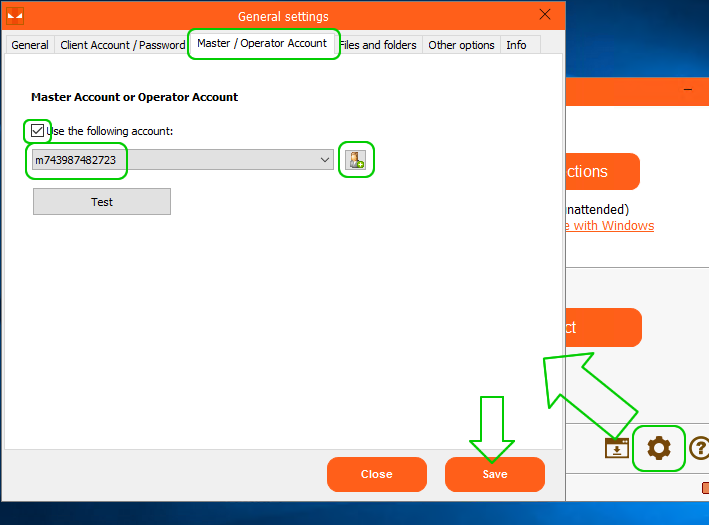 The operator workstations requiring connection need the Master account to be inserted instead. 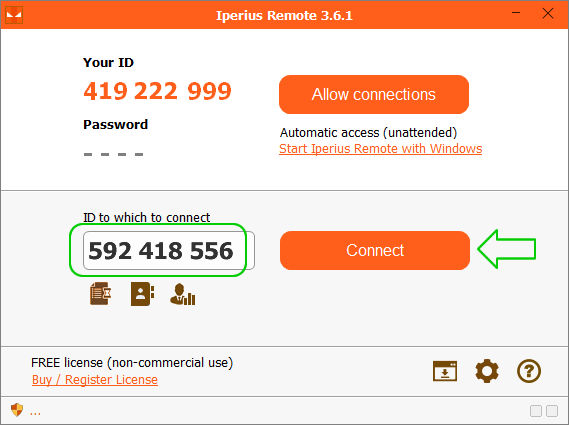 Once the Master account has been inserted, they will be able to see a list of all the Iperius Remote connections (those on which the corresponding Client account has been inserted). To insert the Client account, click on the button at the bottom right of the main window to access the program options. The Client account password will be the one requested when connecting to the remote computer, unless a custom password is specified with the option immediately below it. The Master account must only be inserted on operator computers requiring a connection with remote computers. 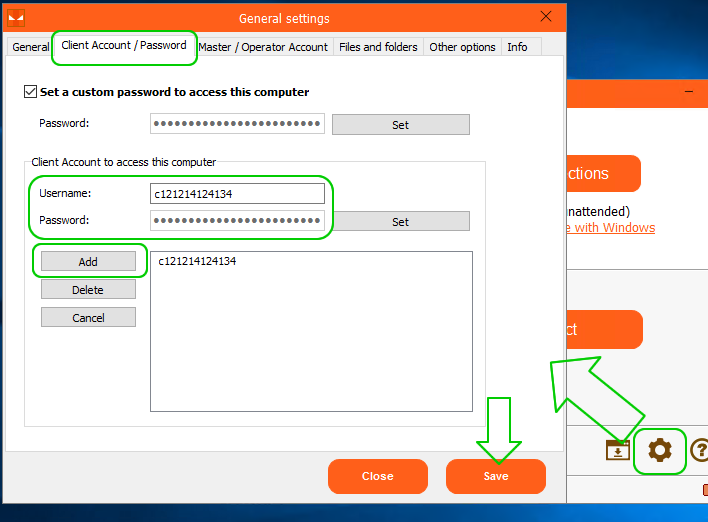 Once the Master account has been inserted, click on "Save" and close the settings window. A new button is now displayed next to the "Connect" button (and the history button). All the connected computers can be seen by clicking on this button (those on which the Client account has been inserted). 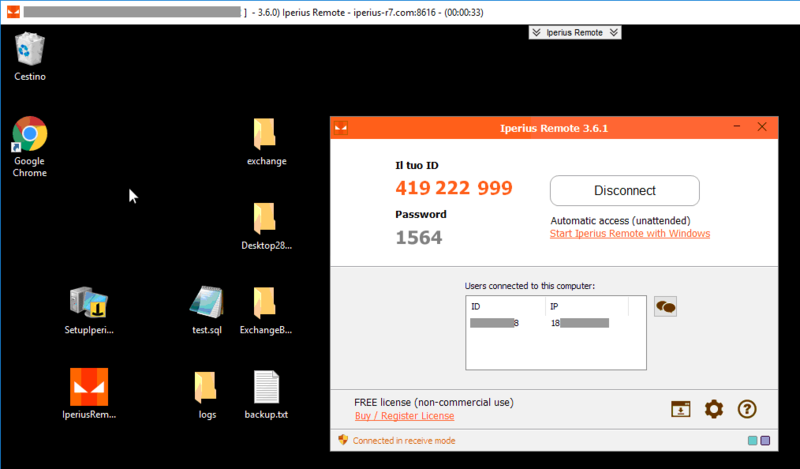 All Iperius Remote connections are shown in the list (those on which the Client account has been placed). You can connect by double clicking rapidly on one of these and giving the password. The software application for connecting remotely and for remote customer support that is simple to use and effective. Runs with a single click, lightweight, stable and secure.